At some point in your childhood your parents probably told you “to sit up straight” or “don’t slouch”. Although these are well-intentioned instructions, our spines are anything but straight even at birth. Ergonomics is the study of designing equipment that conforms to the human body and its movements. Although there has been much written about adult ergonomics, there has been little innovation and/or product development addressing ergonomic solutions for newborns. ASST first became aware of the need for an innovative baby bathing bowl solution while working with the labor & delivery team at St. Joseph Medical Center in Baltimore. The nursing staff had become frustrated with the bathing bowl that had been recommended for a new project at the hospital. In response to the St. Joseph nursing team’s request, ASST began the design development for an ergonomic baby bowl. The new bowl design needed both a sloped bottom that conformed to the C-shaped spinal curvature of a newborns body as well as be fabricated in seamless solid surface. With the creation of several baby sink mockups, the teams collaboratively worked to test and critique the final design. The final result was the Cradle Baby Bowl ® that supports both a newborn’s head and back during bathing. The seamless connection between the bowl and the adjacent solid surface counter also eliminated corners that could pose an infection risk during bathing. A design that is a true blend of both form and function, the Cradle Baby Bowl ® has to date been installed in hundreds of leading edge health facilities and daycare centers throughout North America, Australia and Africa. 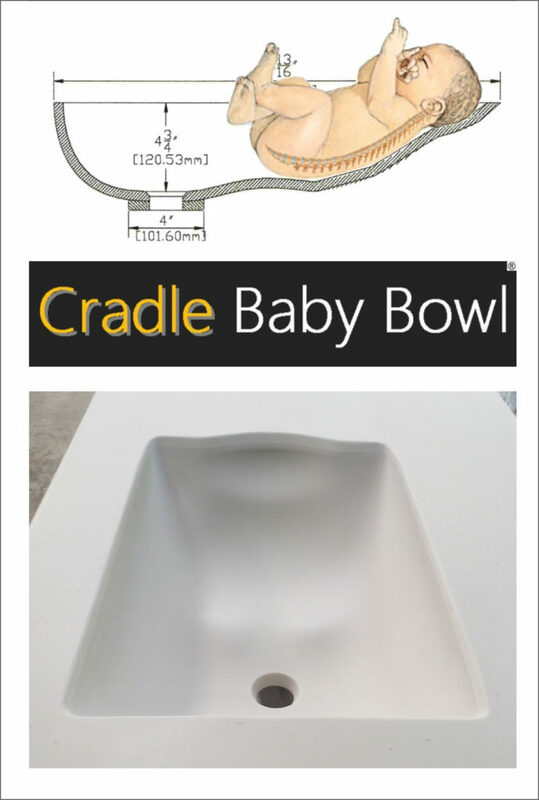 The Cradle Baby Bowl ® is fabricated in all brands of solid surface. Call us today at 717-630-1251 x 305 for a competitive price quote! To see more of the exceptional products we manufacture please see our Products page.